The best comfort food is creamy, cheesy, satisfying—and easy to whip up on a weeknight. This foolproof chicken dish checks all the right boxes. Layers upon layers of flavor, but it only tastes complicated. By combining three different types of mushrooms with some common kitchen ingredients, you can have dinner on the table in just 30 minutes. Wow everyone with your gourmet, healthy cooking skills! <h4><p style="color: rgba(20, 117, 135, 1)">Mushroom Mania</p></h4> Forget acai and spirulina,the humble mushroom is one of the most potent superfoods around. Packed with helpful nutrients like copper, selenium, and Vitamin D, mushrooms have incredible immune-boosting powers. Research indicates that mushrooms may act as a powerful prebiotic, helping to improve your gut health while aiding weight loss. Plus, all kinds of mushrooms—even common white button mushrooms—have <a target="_blank" href="https://www.warriormade.com/content/diet/can-ketosis-reduce-inflammation">**anti-inflammatory properties**</a>. 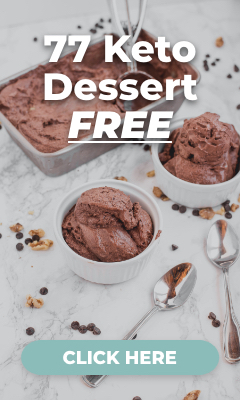 Looking to feel fuller, longer? Mushrooms have two different types of dietary fiber: beta-glucans and chitin. These help moderate appetite. Studies have shown that swapping mushrooms for some of the meat in your diet (like in this recipe) helps you lose weight, lower your blood pressure, reduce your risk of diabetes, and feel healthier overall. <h4><p style="color: rgba(20, 117, 135, 1)">Thyme for a Change</p></h4> Thyme is a classic pairing with mushrooms. Beyond being a great flavor booster, this delicate herb also has amazing health benefits. Used as a digestive aid since Roman times, recent research backs up this traditional wisdom. Thymol—one of the plant’s active compounds—speeds peristalsis and increases digestive activity. It can also reduce gas and bloating. Thyme even promotes increased nutrient absorption, helping you get the most out of your meals! Thyme also reduces strain on your circulatory system, including helping to lower blood pressure. 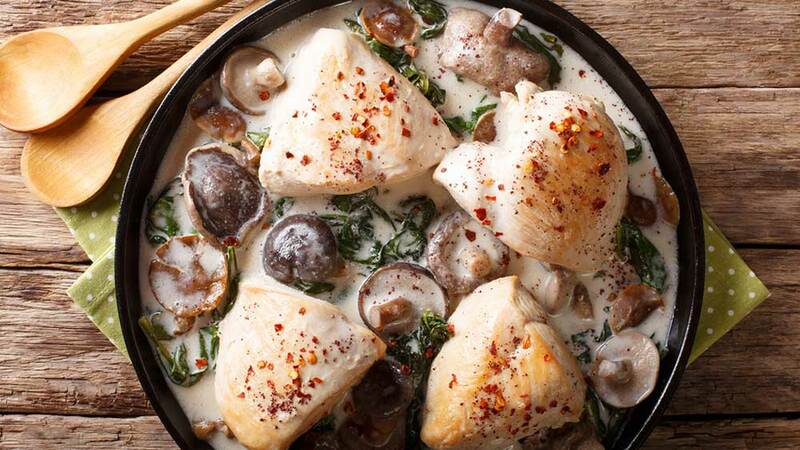 <h4><p style="color: rgba(20, 117, 135, 1)">Creamy Mushroom and Spinach Chicken</p></h4> <h5>Prep Time: 10 mins | Cooking Time: 20 mins | Serves: 4</h5> <h5><p style="color: rgba(20, 117, 135, 1)">Ingredients:</p></h5> * ¼ cup dried mixed mushrooms * ½ cup boiling water * 2 tablespoons olive oil * 4 boneless, skinless chicken thighs, sliced thin * 2 portobello mushroom caps, sliced * 10 ounces (1 standard package) white button mushrooms, sliced * 4 tablespoons butter * 4 cloves garlic, minced * 1 tablespoon ground flax meal * 3/4 cup half and half * ¼ cup white wine * 1/2 cup grated Parmesan cheese * 4 tablespoons garlic and herb cream cheese * 1/2 teaspoon Dijon mustard * 1/2 teaspoon salt * ¼ teaspoon dried thyme * ¼ teaspoon nutmeg, grated * 2 cups baby spinach * Salt and pepper to taste <h5><p style="color: rgba(20, 117, 135, 1)">Instructions:</p></h5> 1. Pour the boiling water over the dried mushrooms in a heatproof bowl or mug. Set aside to steep. 2. In a large skillet, heat the olive oil over medium-high heat. 3. Add the chicken and cook until browned on all sides, about 8 minutes. Remove to a plate. 4. Drain the steeped mushrooms, making sure to keep the liquid they steeped in—you’ll use this in the sauce later. 5. Using the same pan, add the drained mixed mushrooms, the sliced portobellos, and the white button mushrooms. Sprinkle with salt and cook, stirring, for about 5 minutes or until mushrooms are soft. Remove to the plate with the chicken. 6. Turn the heat down to medium. Add the butter to that same pan. When the butter has melted, add the garlic and sauté for 1 minute or until light gold in color and fragrant. 7. Add the flax meal to the pan and stir well; cook for 1 minute. 8. Slowly pour in the reserved mushroom steeping liquid, half and half, and white wine. Whisk well to combine, then bring to a simmer. 9. Whisk in the Parmesan, cream cheese, mustard, salt, nutmeg, and thyme, stirring well to combine. 10. Taste and season with salt and pepper as desired. 11. Bring the sauce back up to a simmer. Stir in the reserved mushroom and chicken mixture. Allow to simmer 5 minutes, or until the sauce has started to thicken. 12. Stir in the baby spinach and allow to wilt. 13. Serve, either alone or over zoodles or cauliflower rice.